It’s 1967 in Detroit. It’s Saturday, and the time is 11:30am. You rush home from playing with friends to turn to channel WJBK TV2 because your favorite Horror Host is about to show a spooky or cheesy horror film and you can’t wait. That host is Sir Graves Ghastly, and this scenario was real life for many kids and adults who grew up watching Sir Graves. This update to Rotten Ink will be all about Sir Graves Ghastly, a host that also spread his hosting humor from Detroit to Cleveland, Ohio as well as Washington D.C.! 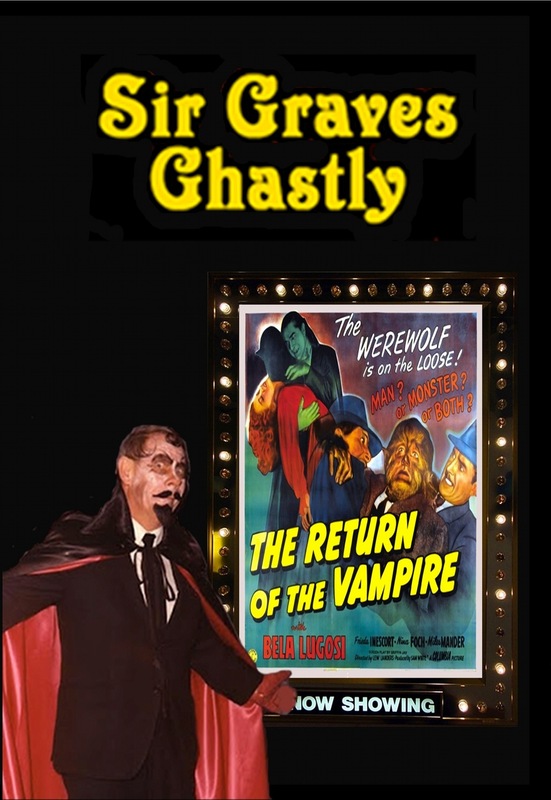 So wear some garlic and bring a cross because we are going to be looking at the vampire of goofy fright as Rotten Ink is proud to bring you Horror Host Icon: Sir Graves Ghastly. For those of you who don’t know who Sir Graves Ghastly is, I must first say shame on you. Second, he is a fun loving vampire who, while a blood drinker, was an over all nice undead being who had a deep voice and an iconic laugh that went like this “Nyaaa-aaaaaah”! 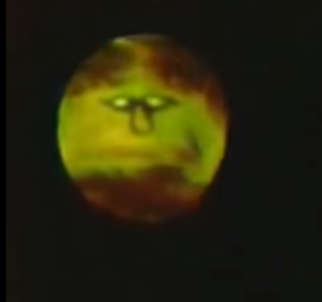 He would start and end his show in a coffin and would be joined by all types of wacky characters with the upside down singing mouth on the moon, aka The Glob, being his most popular. Sir Graves Ghastly’s back story is that he came from an Italian family who moved to England during the time when the Romans controlled it. While there, Graves got into an argument with The Queen who had him hung in the Tower of London, and when this didn’t work he returned as the tongue in cheek vampire we all love! Many Horror Hosts have also been inspired by Sir Graves like fellow vampire Dr. Pureblood of Tales Of The Graveyard Shift from Tennessee. 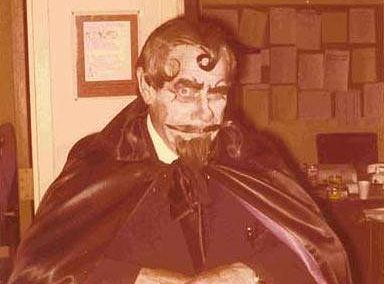 Sir Graves’s impact on television in the Detroit area can still be felt to this day as many people were influenced by and idolized the funny vampire. Sir Graves’ appearance always had him in a long black cape, gloves and a black suit. His hair was always slicked back with a Superman curl in the front; he also rocked a goatee and a curled mustache. While Sir Grave has been off the air for many years now, nothing can take away his impact to the world of Horror Hosting. 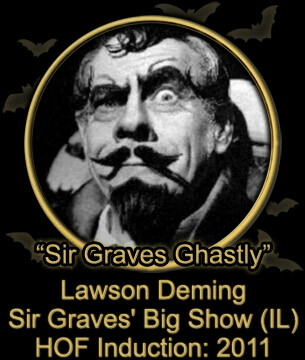 Sir Graves Ghastly was played by Lawson J. Deming, who was born in Cleveland Ohio on April 23 1913 and got his first big break in media via the radio as a freelance worker and eventually an announcer for a Florida station. Radio was a great gig, but in the late 1940’s TV caught his eye. Upon returning to Cleveland, he began working for an NBC station and hosted a movie show called “One O’Clock Playhouse” all the way until 1956. By the early 60’s he also took work as a puppeteer and voice actor for a local Cleveland kids show called “Woodrow The Woodsman” as he lent his voice to many of the animal puppets as Lawson had mastered 27 dialects thanks to his radio work. 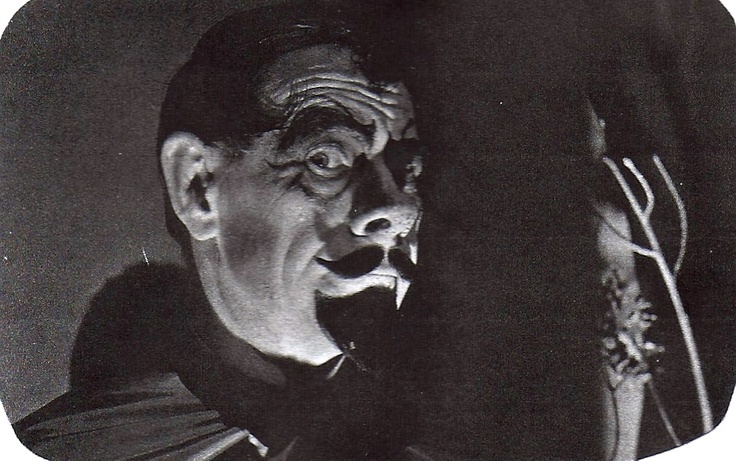 When the NBC Cleveland station did away with locally made kids’ shows in 1965, WJBK TV2 in Detroit picked up Woodrow The Woodsman in 1966 and also offered Lawson a time slot to become a Horror Host, filling the time that super iconic horror host Morgus The Magnificent use to air at on Saturday afternoons. 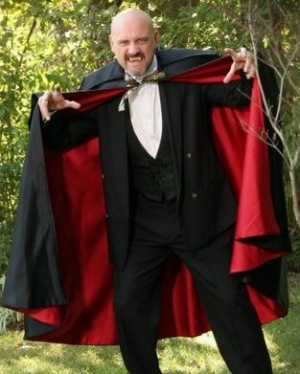 This was the birth of what was originally called “Sir Graves Big Show,” and Lawson and his wife came up with the goofy vampire character Sir Graves Ghastly to be the show’s main host. 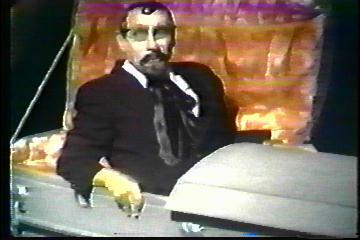 The show took off, and Sir Graves became a well loved Host and lasted for 15 seasons as well as several specials including Halloween ones. 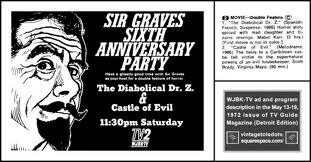 Detroit’s TV watching public seemed to be drawn to the silly vampire and his odd sidekicks, and Sir Graves became popular not just with kids but also adults who enjoyed his humor. 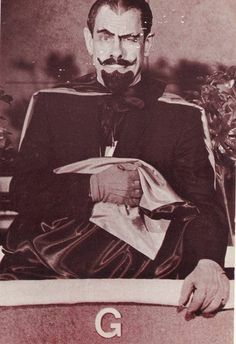 Also during this time in the 70’s Lawson offered the show idea to Cleveland and Washington D.C. and changed the character’s name to Count Alu Card, and while they picked it up, the show didn’t capture the magic it did in Detroit and was dropped. In 1983 TV had changed, and college football games were starting to air on Saturdays. This marked the end of Sir Graves Ghastly, who was cancelled officially in 1983 but had been put on hiatus in late 1982. After the show ended, Lawson went back to doing voice work for a few years until he retired from show business and moved near the Styx River in Medina Ohio. In 1989, he returned to TV to do an interview for a Detroit morning talk show called “ Kelly & Company” where he was able to speak about his long career as a Horror Host. 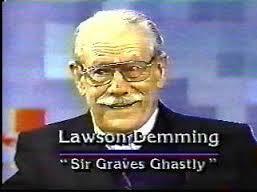 Sadly in 2007, the world lost Lawson J. Deming at the age of 94, but while he is gone, his work as Sir Graves Ghastly lives on in the hearts of those who watched him and fans of Horror Hosting. In 2011 Sir Graves Ghastly joined the first class inducted into the Horror Host Hall Of Fame forever honoring his legacy as a Horror Host. So when you look at the moon, what do you see? 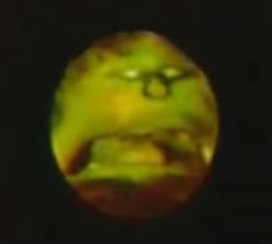 Well those who watched Sir Graves Ghastly saw The Glob, a face on the moon who loved to lip synch to silly songs like “King Kong Stomp” and “ I Want To Bite Your Hand” with style and cheeseball grace. Sir Graves had many sidekicks like his maid and somewhat girlfriend Tilly Trollhouse, the gravedigger and caretaker Reel McCoy among others but none were as popular as The Glob! 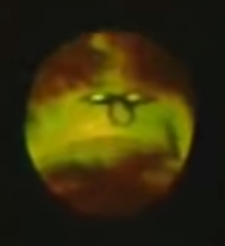 I am sure you’re wondering who played The Glob, well let me tell you, it was Lawson J. Deming who would lay flat and tilt his head back and paint eyes and a nose on his chin and would lip synch the songs as the blood would rush to his head…now that’s a man who loved the art of Horror Hosting! In fact I should say that Deming played most of the characters in the show, even Tilly as he would dress in drag to play the part. So here is to you, The Glob and other sidekick characters! I had always heard the name Sir Graves Ghastly when talking to fellow Horror Host fans and even hosts that I have been friends with for years, but besides small clips on Youtube, I couldn’t seem to find any full broadcast shows to learn more about him. I really learned a lot about the character thanks to the documentaries American Scary and Virginia Creepers. I don’t know about you, but I really enjoy learning all I can about Horror Hosts and enjoy hearing stories from fans about growing up watching their home town host or even their favorite syndicated one. So I am going to have a friend of mine tell you a little about growing up watching Sir Graves Ghastly! As as I mentioned above, Horror Host friend of mine Dr. Pureblood was inspired by Sir Graves Ghastly, and he was nice enough to write a little something about him so enjoy. Thanks, Dr. Pureblood, for sharing your story about growing up and trying to never miss an episode of Sir Graves. I agree with you, I should have taped every Commander USA episode when I was a kid! That’s one of the sad things that we host fans always have to face is the fact many of our favorite hosts episodes are missing and were taped over or thrown away by the stations that aired them. But I always have faith that many of these Horror Hosts who have shows M.I.A. will be found on 2” Quad Tapes, Beta or even VHS and guys like The Northeast Video Hunter are proof that they can be found as he has unearthed Fort Wayne Indiana’s own The Shroud of Nightmare Theatre hosting the Universal Monster film The Deadly Mantis! So here is to hoping that more episodes of Sir Graves Ghastly will see the light of day and land in the hands of fans. 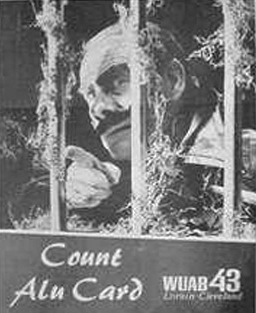 One thing that I find interesting is the fact Sir Graves changed his name to Count Alu Card and went to different markets with his show. It’s clear as day he had to change the name because his parent station owned the trademark or so he thought. And since Sir Graves did this, it makes me wonder how many other horror hosts have changed their name and character. 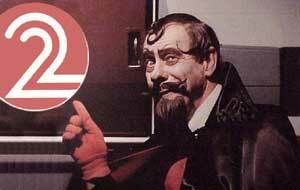 Off the top of my head I can think of Count Shockula who became Dr. Paul Bearer…but I know several others have. So if you’re a fan of Horror Hosts and know a Host who has changed their name and character post it in the comments below. Update: According to Sir Graves fan and Horror Host Lon Madnite, he can remember both Sir Graves Ghastly and Count Alu Card being on in Cleveland at the same time and that the two hosts while played by the same person had a sort of feud with each other! I could only imagine how magical that must have been for viewers watching the two vampires take tiny pot shots at each other, and then it makes you wonder if sides were chosen and if some kids didn’t watch one show cause of the rivalry? But thanks Lon for bringing this cool tidbit to my attention. So we are at the point where I cover the episodes I have of the Host, and while I do have two “episodes” of Sir Graves Ghastly, I hate to say they both are very poorly put together fan reproductions that cut in the lip synching segments from the show’s original airings and this footage of the singing is all of the original material that is known to exist right now from Sir Graves Ghastly’s show run. So let’s get ready to hang out with Sir Graves and all his zany friends! Host: Sir Graves comes from his coffin, welcomes us to the show and ushers us into the tale of terror! We start off with two little guys singing a song about hillbillies. Then Sir Graves joins in and lip synchs a silly song, The Glob sings about King Kong! Puppet Skeletons dance to classical music. Then Sir Graves once more comes in and swoons the viewers with another lip synched creepy classic song and ends the episode. Movie: In 1918, an English family are terrorized by a vampire, until they learn how to deal with it. They think their troubles are over, but German bombs in WWII free the monster. He reclaims the soul of his wolfman ex-servant, and assuming the identity of a scientist who has just escaped from a concentration camp, he starts out on a plan to get revenge upon the family. 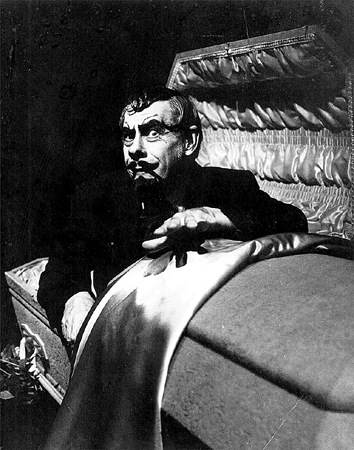 Host: Sir Graves comes from his coffin, welcomes us to the show and ushers us into the tale of terror! What follows is Tilly Trollhouse sings a love song to us as well as tells us a story about three bats, and a few more silly songs one, even having to do with Dracula! Sir Graves joins in the music fun and plays a musical coffin trick and later The Glob sings about King Kong! Puppet Skeletons dance to classical music and throw in a few more tiny lip synch music numbers and you have this fan reproduction. Movie: A psychologically distraught woman is committed to a private sanitarium by the man whom she witnessed commit a murder. It’s sad these very poor fan reproductions are all that is available for fans at this time. If you have any complete broadcast episodes of Sir Graves, please contact me! Sir Graves Ghastly is a legend in the world of Horror Hosting and his silly antics meant so much to so many people and have helped inspire people to become horror hosts themselves as well as inspired the young and young at heart to enjoy a cheesy horror flick every week. This update is dedicated to Sir Graves and all his fans out in the world who remember the impact he had on TV airwaves all those years back. I also want to thank Dr. Pureblood again for sharing his memories with us as well as my brother Bryan and Stumpy Discs for hooking me up with the fan reproduction episodes. 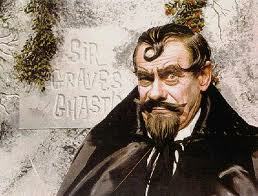 In closing I must say Sir Graves Ghastly is one vampire who truly deserves to be called a Horror Host Icon. Our next update is about another type of icon but not in the Horror Host world rather that of the cartoon world as we take a look at the rascally rabbit Bug Bunny and some Whitman comics I have starring him. So until next time, support your local Horror Host and read a comic or three!